Major League Baseball and the MLB Players Association have reached an agreement on several rules changes that will be implemented over the next two seasons, the two organizations announced Thursday. A single trade deadline, an All-Star game election day and a $1 million Home Run Derby prize will be introduced in 2019. The 2020 season will then bring a new roster structure designed to give more players a chance to shine, while lessening wear and tear on others. The much-talked-about three-batter minimum? It’s not coming this year, but it could in 2020. 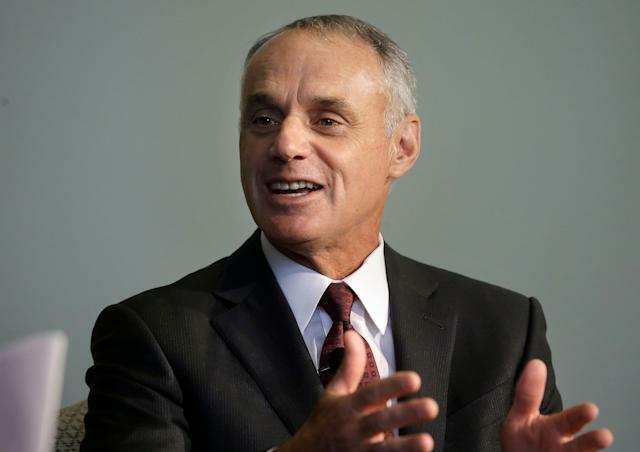 As part of the agreement, MLB and the MLBPA will also begin discussions regarding the league’s growing labor issues, with an eye toward finding common ground ahead of the current collective bargaining agreement’s December 2021 expiration. Those labor talks will hold the key to baseball’s long-term future, but it’s not something that will be negotiated overnight given the current cloudy labor climate. In the short-term, the new rules give us something to digest right here and right now. So here’s a quick look at what each new rule will mean for MLB. Gone are the days of August trades. The single trade deadline will fall on July 31, which has long been the usual non-waiver trade deadline. Also gone is all the confusion that often stemmed from the waiver trade rules. Per the old rule, any trade after July 31 required players on the 40-man roster to clear trade waivers before they could be dealt. If a player didn’t clear waivers, his team had the option of keeping him or giving him and his remaining salary to the claiming team. That’s a lot to keep track of. Or we should say, was a lot to keep track of. This one is cool because it provides a great opportunity for MLB to market its top stars. More importantly, it will afford MLB’s top stars an opportunity to market themselves and let fans in on their personalities. As per usual, fans will be allowed to vote for the All-Star game starters online. The top three vote-getters will then be involved in a one-day election to determine who ultimately gets the honor. It’s a recipe for fun. MLB is hoping to bring more of its top talent into the annual Home Run Derby by raising the stakes. Starting in 2019, the prize for the content will be $1 million. While that’s not earth-shattering money for some players, it’s quite a bit for others, including people who could win it. Aaron Judge, for instance, will make $684,300 in 2019, so winning the derby is certainly in his best interest. We’ll see this one in 2020. Per the agreement, rosters will expand from 25 to 26 players, with a maximum of 13 pitchers allowed, from opening day until Sept. 1. From that point on, rosters can expand to 28 players and 14 pitchers. That might be the more notable change since teams could previously use up to 40 players in a given September game. We’ve heard a lot about a proposed three-batter minimum for relief pitchers, but that won’t happen in 2019. It will in 2020, though, the league says. The MLBPA didn’t agree to the rule change, via reports, but the Commissioner’s Office can implement it anyway next year. The joint announcement only says the MLBPA “will not grieve or otherwise challenge” the rule change in 2020. The pace-of-play tweaks are huge this year, but they’re worth noting: Between inning breaks will decrease from 2:05 to 2:00 for local games and 2:25 to 2:00 in national games. The mound-visit limit, a somewhat controversial addition last year, will be reduced from six to five after a season where the new rule didn’t prove to be much of an issue. This one will take some getting used to, at least verbally. The “Disabled List” is gone, as was reported a while back. In its place is the “Injured List.” And the other change there in 2020 is that it will be a 15-day injured list and not a 10-day injured list. This is effectively changing it back to the way it was up until two years ago.